This book is written like a literature review on the house on Lindley Street - the author, a professional magician in an effort to debunk the rumors about the haunted house on Lindley Street in Bridgeport, CT, draws his content from news articles about the home and first hand reports from documented police reports, paranormal research, and taped interviews with paranormal investigators, police, clergy, and the residents living in the home, the Goodin family, as the events actually unfolded over 40 years ago. It seems very scientific, not at all sensational. At first I didn't know what to think of this as it wasn't your standard atmospheric story of a haunted house - no mood music, no inflection to heighten what should be scary or supernatural... just Stephen Thorne's detached, neutral tone. I think he did Mr. Hall's book a great service with his excellent narration. If you want a neatly wrapped up story, you will be sorely disappointed. 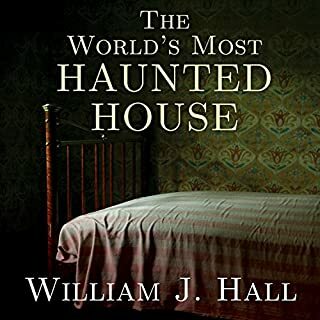 William Hall lays out what was available to him for his readers and leaves it to them to draw conclusions about the extraordinary and supernatural phenomena occurring in the Lindley Street home. My favorite passage was not one of the countless supernatural events occurring in the home, but rather, the conversation recorded between Ms. Goodin and the paranormal investigator who was trying to convince them they should all seek counseling as living in the house was clearly traumatizing for them. She wasn't having it and no amount of logic and empathetic reasoning could convince her that maybe they should give it a try. I don't know how Mr. Thorne was able to keep a straight face and continue narrating this particular passage in a completely neutral tone. I would have been compelled to give the voices character and inflection.